Blue Frog Appliance Repair is a locally-owned and operated home appliance repair service, committed to treating our friends and neighbors in Aurora with the highest regard for your satisfaction and quality of work. Our laundry and kitchen appliance repair team is fully qualified to repair nearly any top appliance brands, including LG, Maytag, GE, Whirlpool, Samsung, Kenmore, Kitchen Aid, Frigidaire, Amana, and many, many more! Our highly-trained professional home appliance repair technicians are dedicated to making sure that we communicate honestly and frequently, work efficiently, help you save money on appliance repair cost, and ensure that your appliances are fixed properly so you can resume your daily routine. Our goal is for our Greenwood Village clients to feel comfortable about the decision to repair your home appliance. 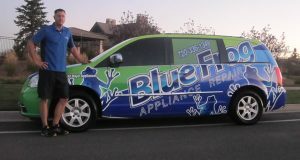 Why should you choose Blue Frog Appliance Repair over other local appliance repair services in Greenwood Village? The answer is simple. At Blue Frog Appliance Repair, we treat our Greenwood Village customers as friends and family, providing the highest customer service standards. From your initial phone estimate to the installation of appliance replacement parts, you will be speaking directly with a seasoned professional home appliance repair technician, to assure communication is clear and all questions and issues are addressed immediately. We appreciate all business from our Greenwood Village clients, but we will never mislead you if there is a potential need for an entire appliance replacement instead of a repair, or if it is an easy fix that you can do on your own. Blue Frog Appliance Repair has been providing dedicated local service to Greenwood Village for over 4 years, and we are quickly building a reputation for superior customer satisfaction. We offer only factory-authorized repairs to the highest industry standards, and our home appliance repair technicians are fully qualified to repair nearly any top appliance brands.